There are times when events or accomplishments in a person’s life warrant recognition or appreciation. 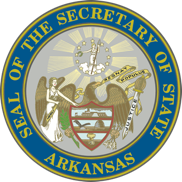 The Secretary of State’s Office seeks to recognize special individuals on these occasions. Below, you will find information about the different ways that we do this and how you can nominate someone for an award as well. 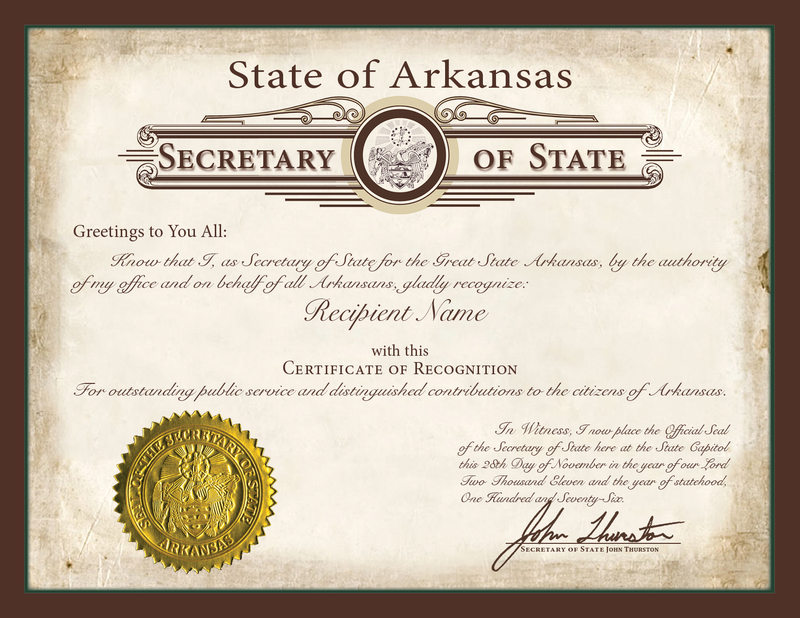 A beautiful gold trimmed and embossed certificate (8 ½ X 11) that is given to Arkansans only, in recognition of their contributions to Arkansas and its communities. It can also be given for milestones in one’s life (i.e., a 50th wedding anniversary, a birthday (age 70 and above), retirement, Eagle Scout recognition, etc.) 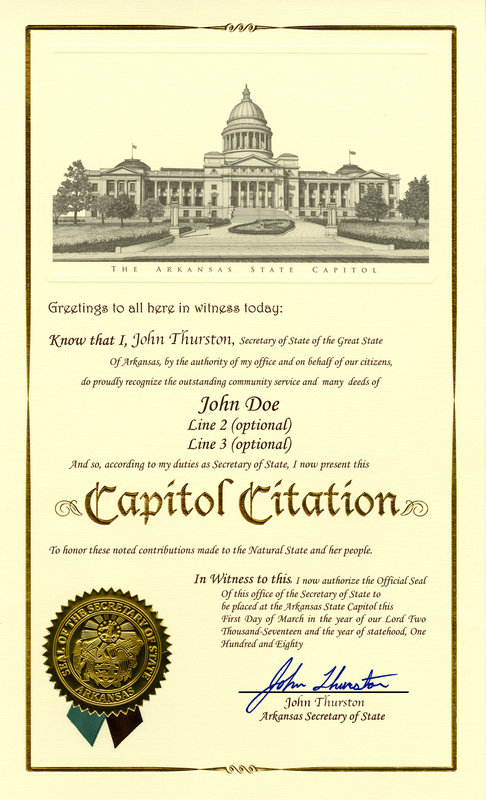 The Capitol Citation will have the gold seal of the Secretary of State and the official signature of the Secretary of State. Please click the link below for an application. (All applications are subject to approval). 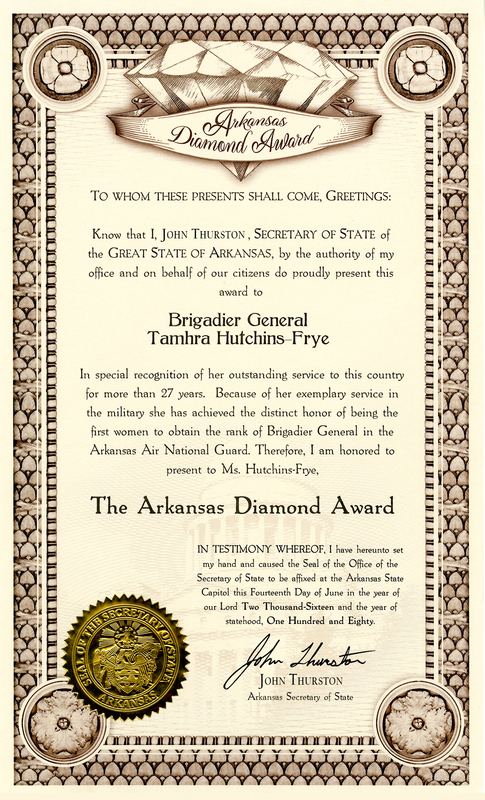 The Arkansas Diamond Award is the highest honor one can receive from the Secretary of State’s office. The person who receives this award has made significant contributions to his or her community through their time, talent and dedication. Their service is one of exemplary quality. Having made an outstanding accomplishment in a field of service may also qualify for this award. This person must be 18 years if age or older and a current resident of Arkansas. The gold seal of the Secretary of State and his official signature will be on the award (Each application will be handled on a case by case basis. If it is found that the Diamond Award is not suitable for the situation, another type of certificate/award will be recommended). Please click below for an application. This certificate is a versatile certificate that can be tailored to an individual’s accomplishments in just a few sentences; for example, special student accomplishments, participation in special events, service rendered for an activity, etc. 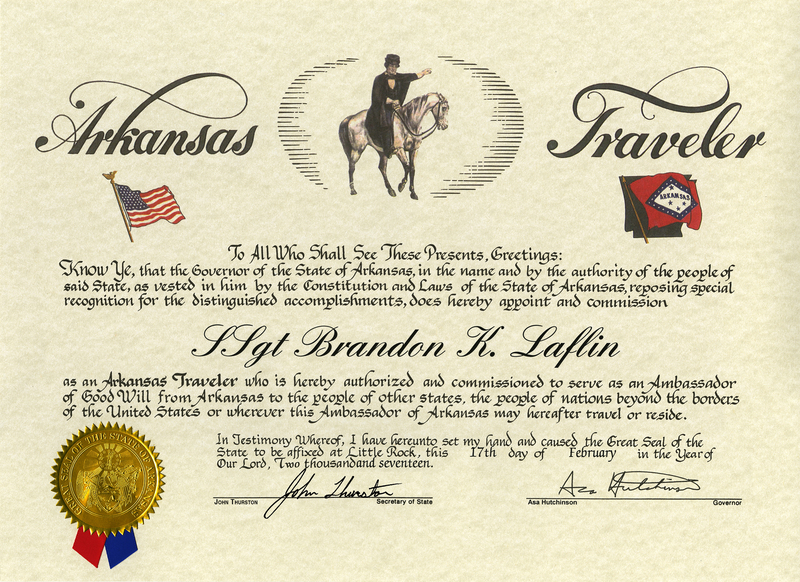 The certificate will have a gold seal and the Secretary of State’s signature.